It was a Saturday afternoon, I had a bit of a cold. So I settled into my bed to watch cooking shows on PBS. One of my favorites is “Mexico One Plate at a Time,” with Rick Bayless spotlighting a different region of Mexican cooking each season. This season, he’s in Oaxaca, which is a part of Mexico I’ve never had the privilege to visit. I often get inspired to cook by things I see Rick talking about on his show — last season he was in Baja, and I found myself trying out air-dried machaca beef, shrimp tacos folded in fried cheese and even an avante garde foamy sea urchin ceviche. And now, lying in bed, I watched as Rick, visiting a sustainable farm in the Oaxacan mountains, dug into something called a tlayuda. Tlayuda, it would seem, is the pre-Hispanic name for “Mexican pizza.” (Drop the “t” from the beginning and you’ll have an easier time saying it.) 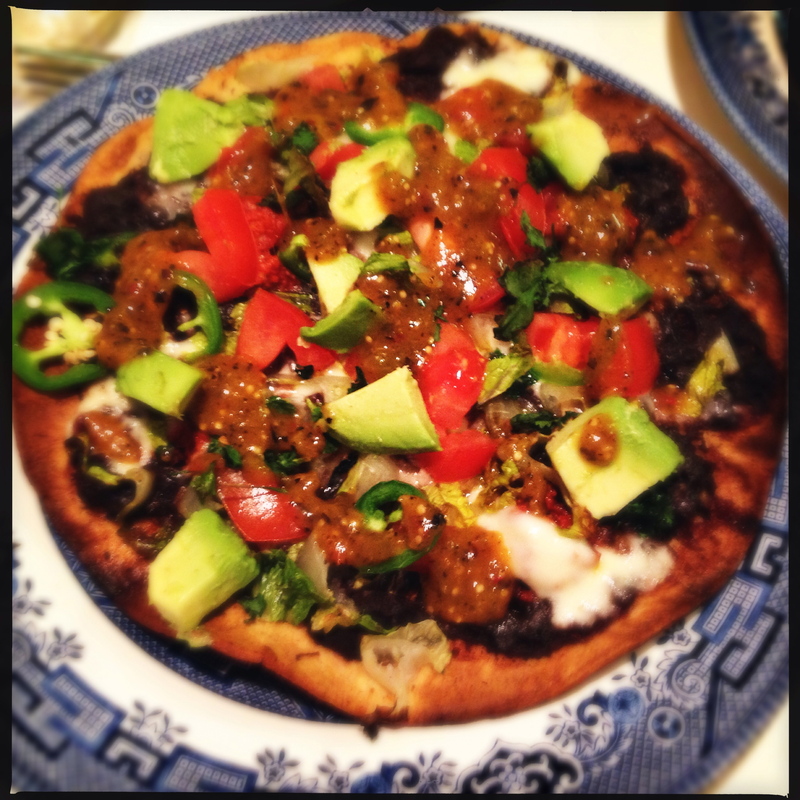 But this was unlike the Taco Bell Mexican pizzas you’ve grown accustomed to. Here was a giant corn tortilla that had been grilled on a comal, then brushed with “rustic” lard and bean paste, then sprinkled with Oaxacan string cheese and an array of toppings, then placed back on the comal to crisp up. Although I would be making a new tequila cocktail I’d just invented that day for our friend Jon who was coming for dinner, I had already planned and purchased for gourmet hot dogs. So the tlayuda would have to wait for another evening. Plus, I wanted to try to find the giant “leathery” (as Rick described them) tlayuda tortillas that defined the dish. A few days later, I set to the task. Securing the large tortillas but failing to find Oaxacan string cheese at the Oaxacan market on my way home and lacking the time to drive out of my way to another one (Oh! the suffering! ), I opted for a mixture of Italian string cheese and Monterey jack. I created the rustic lard by cooking up a strip bacon with a little regular lard, and then mashing the whole business up. The rest — mashed black beans, tomatoes, lettuce, avocado — was standard. I added a personal touch in the form of shaved jalapeño and some homemade salsa rojo. Winter, such as it is, finally came in Southern California. I was standing out at my makeshift comal (i.e. the Weber) as the sun set behind the ridge and the temperature dropped into the 40s, grilling my tlayudas while I shook in my boots. Despite the elemental dissonance, the dish turned out splendidly beautiful and delicious, the kids’ fear of the unknown allayed somewhat when I introduced the big flat foreign objects as “Mexican pizzas”. You gotta play to your audience. The recipe below is a vegetable version with no meat save the lard and little bit of bacon. You could happily add some shredded chicken, pork carnitas or chorizo (as I did in the video), carne asada, even fish! Consider the tlayuda a blank canvas for your Mexicano culinary creativity. Place lard in a skillet and melt. Add bacon strip and cook until just crisp. Remove from heat. Drain bacon lard into a bowl. Crumble or finely mince the bacon, as fine as you can get it, and stir back into the lard mixture. Let cool. Spray the 4 corn tortillas lightly with oil, and place on a hot grill (a hot pan will also work). Toast until crisp, stiff and browning at the edges. Remove from heat and cool. Place beans in a saucepan with about a cup of water, and heat over medium high. When the beans boil, use a potato masher to mash thoroughly until you’ve created a sort of paste. Season to taste with salt. Compose your tlayudas: On each tortilla, spread first a quarter of the lard mixture, and then a few tablespoons of the black bean paste. Top with meat, if using, and then cheese. Top cheese with lettuce and tomatoes. Heat your grill to medium high. Place tlayudas on the grill (you could also do this step in a 400-degree oven) and close cover. Watch closely so the tlayudas don’t burn. When cheese has melted and lettuce wilted, remove from heat. Top with avocado, cilantro and salsa, sprinkle with flaky sea salt, and serve. Nahhh, that’s an easy one! Come on, don’t give up so easily! I believe in you!!! We’ve got Bayless himself here now. But the restaurant has gotten mixed reviews. So I’ll just have to do it myself! 🙂 Heading up into the 80s again this weekend.